Be the first to share your favorite memory, photo or story of Elma. This memorial page is dedicated for family, friends and future generations to celebrate the life of their loved one. 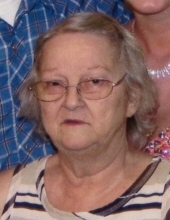 Elma DeBrodie, 71, of Fulton passed away on Saturday, February 9, 2019 at Boone Hospital. She was born in Mokane on March 12, 1947, the daughter of the late George W. Summers and the late Reba (Langley) Summers. On December 5, 1965, Elma was married to Edward Howard DeBrodie. He preceded her in death on February 9, 2017. Elma worked as a Medical Technician for Fulton Manor. She enjoyed being outdoors, gardening, and bird watching. Most importantly, she enjoyed time spent with her grandchildren. Elma is survived by grandchildren, Ryan Foley, Justin DeBrodie, Krista DeBrodie, and Lacey DeBrodie; great-grandchildren, Oliver Foley, Micah Vladeff, and Braelyn Vladeff; daughter-in-law, Trish DeBrodie; and numerous nieces and nephews. In addition to her parents and husband, Elma was preceded in death by sons, Edward Washington “Boomer” DeBrodie, and William Walter DeBrodie; daughters, Darlene Dawn Foley, and Lisa Renee DeBrodie; brothers, Buck Summers, John Summers, and Jr. Summers; and sisters, Ethel Coffelt, Dorothy Sneller, and Annie Hall. Graveside services will be held at 1:00 p.m. on Wednesday, February 13, 2019 at Hillcrest Cemetery with Pastor Joey Owen officiating. Memorial donations are suggested to St. Jude Children’s Hospital, c/o Maupin Funeral Home, 301 Douglas Boulevard, Fulton, MO 65251. To send flowers or a remembrance gift to the family of Elma DeBrodie, please visit our Tribute Store. "Email Address" would like to share the life celebration of Elma DeBrodie. Click on the "link" to go to share a favorite memory or leave a condolence message for the family.